Before last week, some Citrix partners — and even some high-up Citrix execs — felt the company’s server virtualization efforts were lacking. But with last week’s news that Citrix will give away XenServer and associated features like live migration, the company seemingly reaffirmed its commitment to server virtualization, and most of those complaints seem to have subsided. It comes as no surprise to us that Citrix is offering XenServer for free. … Most Citrix customers are really just looking for a well-supported Windows platform, and since Microsoft launched Hyper-V, they can get what they need directly from source. To really get value from Citrix, customers need to buy a Windows license anyway, so they may as well get their virtualization engine included. Citrix will stop developing XenServer altogether since it is not needed to make XenApp work. 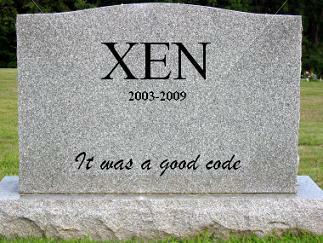 This will signal the eventual end of XEN. You really have to applaud Microsoft’s Server group here: XEN could have been a serious competitor to them, but instead it ended up being a partner and technology provider. Now, when the difficult economic climate could have created considerable opportunities for the open source XEN offering, it is instead largely out of the picture due to its relationship with Citrix, and by extension with Microsoft. Does Beloussov have a point? Does the free XenServer really signal phase two of Microsoft’s evil genius plan to take over the virtualization market? Or is he just trying to drum up some publicity for his own company (very successfully, considering I’m writing this blog) at a time when virtualization is a hot topic? To hear more of Beloussov’s thoughts on the virtualization market, check out this podcast interview recorded at VMworld 2008 in Las Vegas. I don't agree with Serguei Beloussov. I belive he's just trying to create paranoia among Xen users, especially those who still believe in Open Source. This is purely propaganda, just because Parallels also sells Virtuozzo at the price of an arm and a leg, and because he knows what a pathetic excuse of a virtualization solution openvz is. Citrix's move to make XenServer free has just put Parallels in a tight spot. I completely disagree with Mr. Beloussov as well. I believe he fears that the successful hypervisor virtualization solutions that Citrix and VMWare provide will overtake his less-than-acceptable host-based virtualization solution called virtuozzo. The fact that Parallels is developing a hypervisor solution as well pretty much confirms that. We were a Parallels partner for many years and relied heavily on Virtuozzo to power our initial virtualization efforts. The solution is pure garbage. Period. I would never go back to a host-based technology. Ever. Their overseas support is woefully lacking as well.... so as you can guess, I am 100% behind Citrix and wish them tremendous success!